Indy Parks Bark Parks are a great place where owners and their four-legged friends can enjoy the company of other dogs while being off their leashes! Several Indianapolis parks have special "Canine Companion Zones" or bark parks located in the park. This is your guide to Indy area bark park etiquette and basic guidelines for enjoying the dog parks around town. Indianapolis has four fabulous dog parks where your four-legged friends can play and enjoy the company of other dogs, all with the freedom of running off the leash. 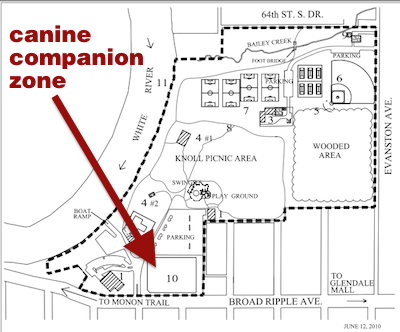 Look on the park maps for the "Canine Companion Zones". All dogs in the bark park must wear a current rabies tag and an Indy Parks Pooch Pass tag. You are responsible for the behavior of your dog. Any dog exhibiting aggressive behavior is the responsibility of the owner. The Canine Companion Zone is not staffed or supervised by any agent or employee of Indy Parks or the City of Indianapolis at any time. Users therefore are required to abide by posted rules and etiquette at all times while on the premises. Wild animals in the parks such as skunks, raccoons, badgers or stray dogs, all of which might injure or infect your dog(s). $75 - Annual Pooch Passes are based on the January-December calendar year. Passes include a tag for your dog and a gate access device for you for either Broad Ripple Park or any of the other three Canine Companion Zones. $125 - Very Important Pooch Passes are based on the January-December calendar year. Passes include a tag for your dog and a gate access device for access to all four Indy Parks Bark Parks. VIP passes are available for purchase at the Broad Ripple Park Family Center. $5 - Daily Pooch Passes - visit one park, just for the day. Obtain a Pooch Pass or VIP pass at Indy.gov Bark Parks page right here. Where are your favorite places to take your dogs in Indianapolis? Share your thoughts in the comments below.